Since 1990, Kallu Mian nihari walla's shop is a haven for foodies. The nihari here is sublime, worth elbowing your way around in Old Delhi. Kallu Mian passed away on 18th April, but we hope his legacy lives on. Old Delhi's legendary nihari walla, Kallu Mian, passed away on 18th April 2016, but we hope his legacy lives on. The air saturated with enticing whiffs of kebabs, and the melange of cultural influences are just remarkable. That's the mystique of Purani Dilli. Till you head there and indulge, you really won't know what you're missing. 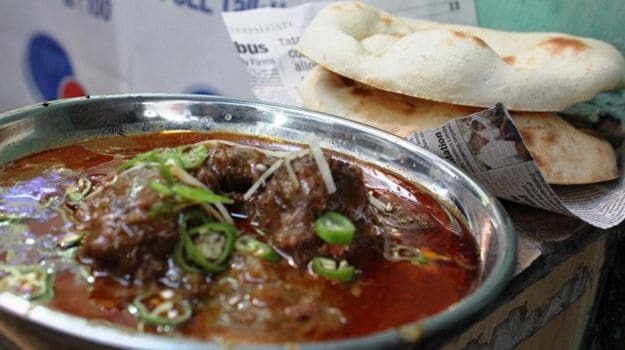 And your Dilli 6 journey can't be complete without savouring the legendary nihari from Kallu Mian. Hidden behind Delite Cinema, near 'A one chicken corner' shop and a Vodafone hoarding, in a dead-end gali of Old Delhi is a haven for foodies that carved a niche for itself some 20 years ago. Everyone swears by his nihari. Just mention Kallu Mian to a true Dilliwala, and you're sure to be flooded with overwhelming memories. So who is the man behind outstanding the nihari? "Main Kallu ke naam se mashoor hu", he had told food blogger Kalyan Karmakar of Finely Choppedfame. He was born with the name Mohammed Rafiquddin, and was the son of another nihari cook Mohammed Nazmuddin, husband to Shamshad Begum and father to two daughters, Ruqqaya and Uzma, and four sons, Rehaan, Faizan, Faisal and Saqib. He opened the shop in 1990 and only served Nalli-Nihari. Slow-cooked for hours and oh so tender, simmering in gravy and beautifully spiced, Kallu Mian's nihari is worth elbowing your way around in Delhi. Just before serving, it's garnished with a squeeze of lime, thin julienne slivers of raw ginger and green chillies. And the result? Sublime. It's served with a gorgeous Khamiri Roti on the side, right out of a clay oven and handed over in a newspaper. I still remember the first time I tried the duo, my fingers were almost scalded. I then hurriedly grabbed a piece of the roti and lapped up the curry. The meat was so soft, it just melted in my mouth. And the intensity of the chillies along with the robust meaty flavours paired beautifully with the soft roti; it was like an explosion of flavours and yet no one flavour more pronounced than the other. All I could see were fireworks, complete with the heat and dust of Old Delhi. I only realised how heavenly it was once the plate was polished off in a matter of minutes, and I was ordering another portion without thinking twice. If you believe that there is more to Purani Dilli than Kareem's, you have to head here. Kallu Nihariwalla's shop starts serving nihari at 5:15 pm sharp, and don't be alarmed by the crowd that 'queues' up. It's like the first day of a Shah Rukh Khan movie or the stock market - pandemonium unleashed. Getting a plate of nihari is the ultimate challenge while the heat hits you like a furnace. If you don't wish to be pushed and shoved while savouring each bite, you can park your car at Asaf Ali Road and eat the packed nihari there. CommentsUnfortunately, Kallu Mian had been tackling diabetes among other things, and decided to hand over the baton to his sons a while ago. When things became worse, his rickshaw rides to the eatery (to check on things, no doubt) came to a halt too. He was on a strict vegetarian diet during his last three years. It is saddening to hear of such an end for someone who has served millions.